Everything you have created matters profoundly. These six words were high praise coming from Lord Michael Hastings, Global Head of Citizenship of KPMG International during the Enactus World Cup Opening Ceremony a few hours ago. And they are a great reminder of the reason we are together in Beijing: to celebrate the incredible work of the teams, and the impact we collectively have when we decide to see opportunity and enable progress. Registration opened mid-morning and became a great area for our attendees to gather, meeting new friends and visiting with old ones. Teams then had the chance to set up their displays for the Culture Fair. After much planning and preparation, students donned traditional clothing, prepared food, and got ready to introduce their country to the world. As usual, this event was well attended with students, faculty, judges and observers all in attendance. 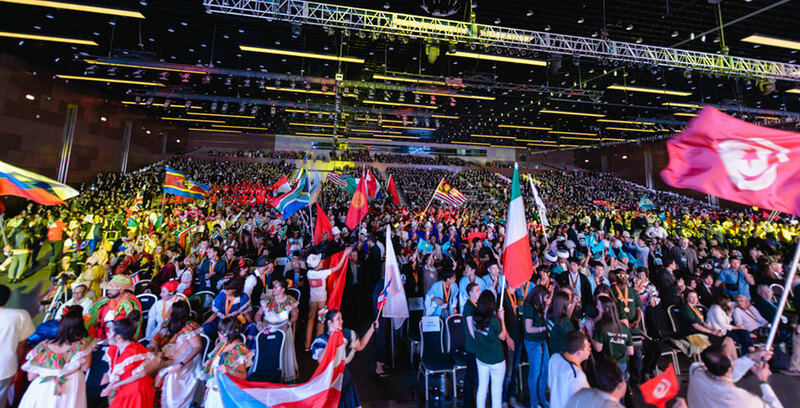 Our delegates then made their way to Plenary Hall where the crowd was a sea of color with waving flags and the room was buzzing with excitement and energy. Madame Li Xiaolin, President of CPAFFC, our Host Organization, opened the My Dream, Our Dream Special Forum and welcomed everyone to Beijing. It happened to be her birthday – what a way to celebrate! Next up, Jean-Pascal Tricoire, CEO and Chairman of the multinational electricity company Schneider Electric took to the stage, and commented on the importance of our global world and the responsibility that goes along with it, particularly as it relates to access to power and sharing technology. David Brooks, Executive Vice President of Coca-Cola of Greater China and Korea spoke next, sharing China’s advancements and the dream Coca-Cola has for the country: blue skies, clean water and sunshine for every little boy and girl wherever they live across China. Wouter de Smet, an agronomist for Nestlé China spoke next, sharing his experience working with coffee farmers and challenging all of us to think about their hard work the next time we enjoy a cup of coffee. There was also a ping pong player, a famous Chinese singer, and a group of kids so cute, you just have to watch for yourself. The beautiful Parade of Nations was next, with the teams from each participating country taking the stage. It’s such a visual experience and fun to see what each team has planned from a special dance to a custom cheer. After Lord Hastings spoke, Bernie Milano, President and Trustee of the KPMG Foundation oversaw the timeslot drawings and league assignments for the Opening Round of Competition. As he drew country names, they had the chance to select their time slot, which was all managed on the big screen. If you missed the live stream or want to check out the league assignments, our World Cup site is the place to go and will be a great resource for you throughout the event. You can also watch the Opening Ceremony Highlight Video above. As our attendees head to bed and try to sleep despite all the excitement, we close today feeling grateful to our host country for such a special experience and proud of our members for their courage to take action and make a difference. See you tomorrow.